Getting there: with the (international) train Amsterdam-Schiphol airport - Berlin Hbf to Rheine (Germany). About 3 hrs. from Amsterdam Schiphol. See for the timetable: reisplanner NS. Or from Berlin Hbf: about 4 hrs. See for the timetable: Reiseauskunft DB. 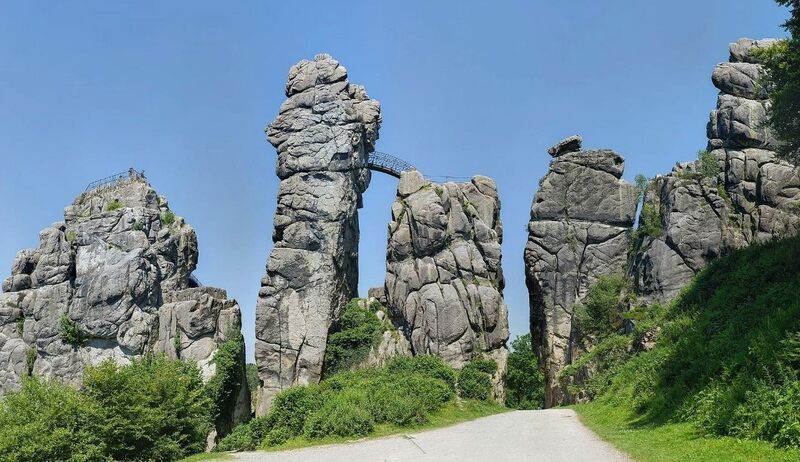 The trail starts at the railway station Rheine and leads you through the old town of Rheine.The trails ends in Horn-Bad Meinberg, on the 440 m. high rock formation of the Lippischer Velmerstot. At this point you have a fantastic view overlooking the surrounding. The trail is named after Arminius, a German warrior - Hermann the German, or Cherusk - who defeated some Roman legions in 9 AD. 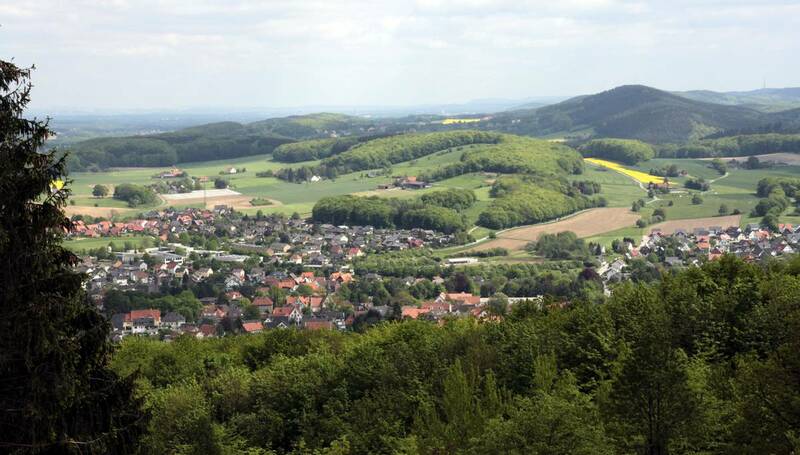 The trail is known as one of the most beautiful hill walks in Germany. Map: Hermannsweg, pub. : Leporello, scale 1:25.000. Accommodation: “Zimmer frei”( B&B), hotels, private pensions, whatever you want. A lot of choice on trail. 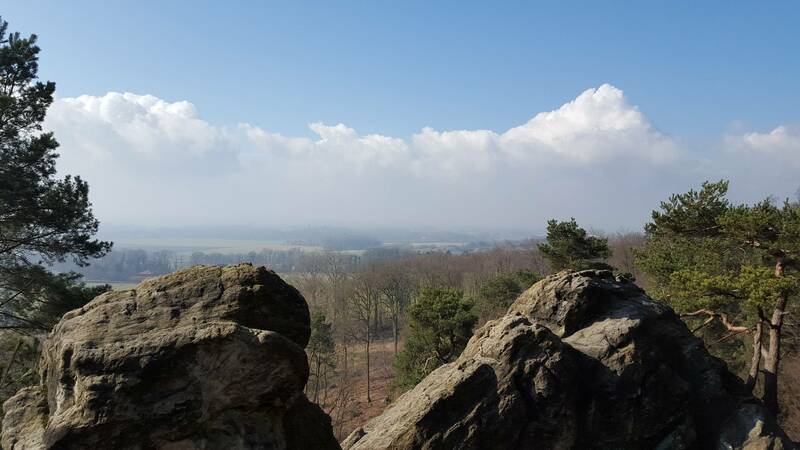 Height: this ridge walk is never higher than 300 m. (the sections we walked). The Hermanns' Walk is a comparably easy walk, and there are no major differences in altitude. The trail is well marked: a white “H “ in black .Total lenght of the trail: 160 km. Thanks to very good bus and train connections, you can easily choose only individual stages as a day hike or put together your favourite stages for a hike lasting several days. 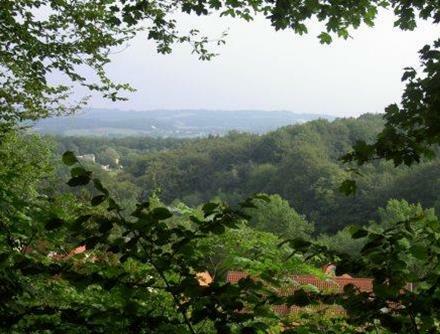 October 2013: five sections of the Hermanns-way, Teutoburgerwald, Germany, a ridge walk. A rather flat stage, nice walk, on the way to the hills. From (Halle) Bielefeld you can take the train(s) to Rheine - Osnabrück (Amsterdam) - Haller Willem trains - or Berlin. 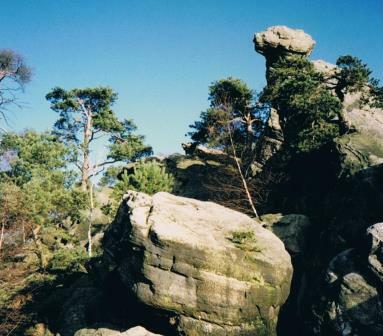 On trail: a very nice walk along - most of the time - the ridges of the Teutoburg forest. 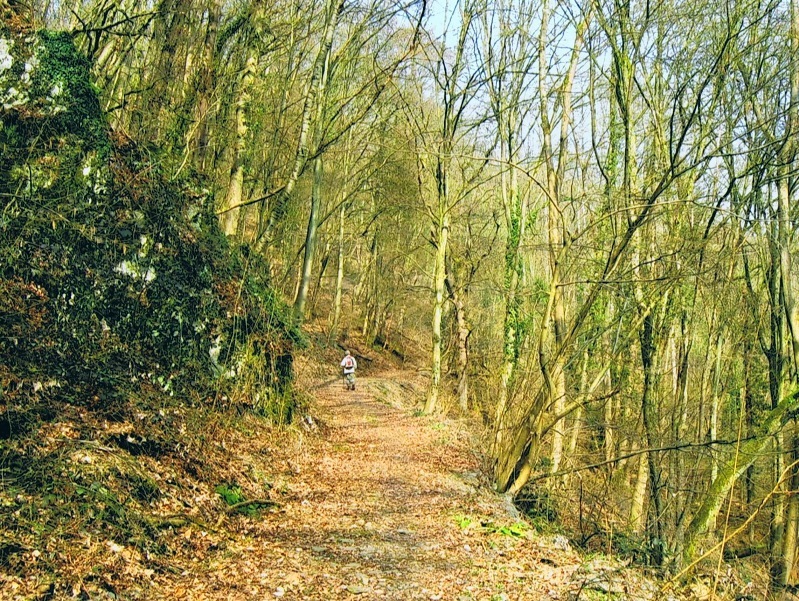 The trail is dotted with dramatic natural, cultural and historical features. The Dörenthe cliffs – a sandstone formation stretching for four kilometers (day 2), Bevergern on day 1, or the medieval town of Tecklenburg (day 2-3). The castle of Bad Iburg (day 3) ; disused quarries, nowadays given back to nature, and beautyful forests. The protected area of Freeden (day 4) or the Ravensburger Castle day5. The dense forests you walk through sometimes hinder the views…….but there are still plenty to enjoy. An easy walk, with some steep climbs. Sometimes asphalt. And, of course, the Bratwurst!